Pretty Pooches Points Of View! : Creative Feeding Part 1 - Fillable Rubber Toys and Boxes! Pretty Pooches Points Of View! Creative Feeding Part 1 - Fillable Rubber Toys and Boxes! Dogs love to work their minds, and they love food. Mix the two and it makes a fantastic activity for your pet! These three methods are all suitable for pets of all sizes and ages, but must be scaled up or down to make sure you use a safe sized toy or box for your pet. Too small a toy can be choked on by a larger dog, or too large a toy could get stuck on a smaller pets head, which may sound funny but could be fatal. Always make sure the size you choose is the right size for your pet, and is undamaged before giving it to them. In part 1, I will focus on the fillable rubber toys and filled boxes. 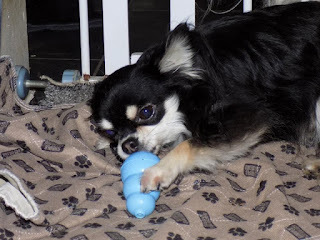 Puppy Kongs, which come in blue or pink, and are softer rubber to allow for chewing when puppies are teething. This is also perfect for dogs who enjoy working for their food but do not chew their toys. Senior Kongs, which are usually purple and also made of the softer rubber to make sure older dogs teeth and gums are not harmed, as some veteran dogs can have weakened teeth due to their age or health conditions. This is also ideal for light chewers. Red "Classic" Kongs, which are their main ones. It is made from tough red rubber, and comes in multiple sizes to suit different breeds. This is their oldest and most popular type for adult dogs. Most dogs find this is the ideal pick when choosing a fillable toy. Black "Extreme" Kongs, which are designed for adult dogs with powerful jaws and those who are strong chewers. These are ideal for breeds like Staffordshire Bull Terriers, German Shepherds and other powerful chewers. If you are worried your dog will chew their Kong, try the Black rather than going for the Red for that added toughness. Puppy, Senior, Classic Red, Extreme Black. Kongs come in a massive range of sizes from XS which is perfect for a Chihuahua puppy, all the way up to XXL for extra large breeds like Mastiffs and Great Danes! You can buy similar toys by other companies which should work as well, however I personally prefer Kong as they have been reliable for me for years. We had a red Kong that was still in excellent condition after 7 years of regular use and was only replaced as it was lost during a move. Black Kong Extreme and Red Kongs - XS to XXL! Fillable toys are very simple - you stuff them with something yummy and put them down for your pet! You can buy specially made pastes and biscuits designed to be used with them but you can use just about anything! I have used tuna, chunks of cooked chicken, cheese paste, grain-free biscuits, banana, peanut butter, raw mince, tripe, canned dog food, and all sorts of other yummy treats. I often use them to give my dogs their dinner, especially when they have their raw minces. 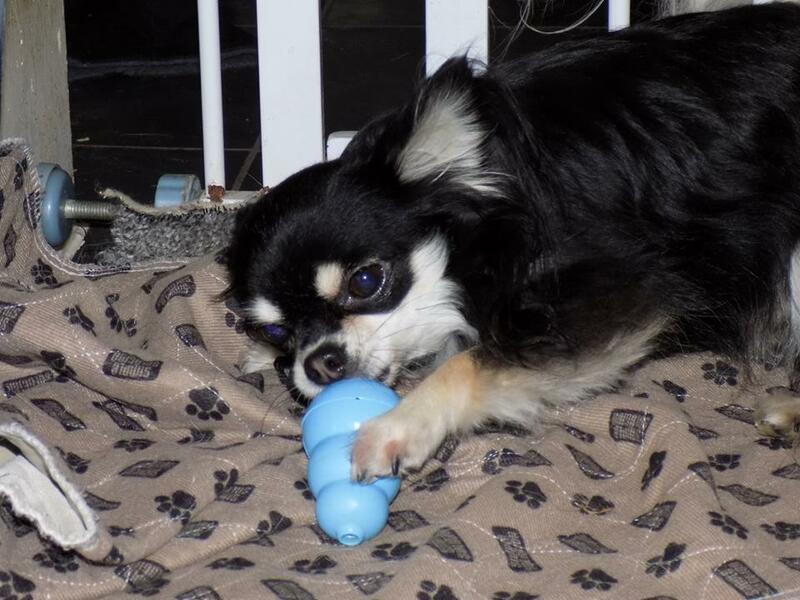 All the different flavours make Kongs a real favourite as they never know what they will find in them next. You can also freeze filled Kongs to make them last even longer, or as the perfect summer treat to keep your pet cool. Just remember whatever you put in them, to reduce their main meals by that same amount so you don't end up overfeeding. Fillable Rubber Toy Alternative - Boxes! A good alternative to filling a Kong or other rubber toy, is to find small cardboard boxes, put dry foods and treats inside, and re-seal so your dog has to get into the box to get to the treats. Most dogs decide to shred the box and make a big mess, but its a simple clean up and the dogs love it. When first attempting this, you should use strong smelling treats in a thin box so they can smell that there is something interesting in the box. Once they understand that this is a fun game, you can then use thicker boxes and food or treats that don't have such a strong scent. You can even stack boxes inside each other or use several boxes to make it more challenging and more fun for your pet. Boxes are not recommended for wet or raw foods as the food sticks to the cardboard and can be eaten by the dogs, but is pefect if you feed dry food (kibble) or for treats. It is excellent mental stimulation so an ideal game for when its cold and wet out! We play these games very often with our dogs and teach them to any new fosters that come in. We even fill boxes with vegetables and hay for our rabbits, so if you have other small pets you can try this game with them too!